38 Pioneer PLX-500 K Turntable (Black) packages available. Drawing on Pioneer DJ's heritage in making high-quality decks, the PLX-500 inherits the layout of the PLX-1000 professional turntable and produces warm, clear analogue sound. The high-torque deck is ideal for scratching and comes with everything you need including a cartridge, stylus and slipmat, and its USB out means you can easily make high-quality digital recordings of your vinyl collection in our free rekordbox software. You can use the PLX-500 and the rekordbox dvs Plus Pack to play and scratch digital files when you combine them with a compatible DJM mixer and the RB-VS1-K Control Vinyl. And you can choose between the black (PLX-500-K) and white (PLX-500-W) versions to match your set-up or the design of your home. The PLX-500 series inherits design features from the PLX-1000 professional turntable to produce the high-quality sound you expect from vinyl. The shortest possible audio routing from the stylus to the outputs reduces distortion, and the phono and line outputs mean you can connect directly to your sound system or powered speakers to enjoy warm sound. An in-built USB output means you can record your vinyl collection to high-quality digital WAV files by simply connecting the PLX-500 to your PC or Mac. Digitising your tracks is easy using our free rekordbox application and, once they’re in your rekordbox collection, you can play them using the PLX-500 and a rekordbox dvs set-up, or on a DDJ controller, or on CDJs via USB. You can also enjoy them on your mobile devices whenever you want. Using its audio analysis technology, rekordbox detects the silence between tracks and creates a separate file in your collection for each one, so you can just press play and record a whole album from an analogue source to individual tracks without resetting the recording in between songs. After you’ve finished recording you can name and tag all your new tracks. Connect the PLX-500 to your computer with a USB cable. Open our free rekordbox application (version 4.2.1). Click the record button in the software and it enters Record Standby mode. Press play on the PLX-500. rekordbox begins recording when the music starts. When you’ve finished recording, press stop. A window opens in rekordbox where you can enter information for each track including name and artist. The tracks then appear in your rekordbox collection and you can search for them by name, artist etc. The high-torque, direct drive PLX-500 is ideal for mixing and scratching on. You can also combine it with the rekordbox dvs Plus Pack to play and perform with your digital files when using a compatible DJM mixer and the RB-VS1-K Control Vinyl (available separately). You can enjoy the vinyl sound of your records and their artwork at the same time thanks to the dust cover that incorporates a stand for displaying record sleeves when open. The PLX-500 inherits its slick design from the professional PLX-1000 turntable and you can choose between the black (PLX-500-K) and white (PLX-500-W) versions to match the colour of your gear or the interior of your home. Considering purchasing the Pioneer PLX-500 K Turntable (Black)? Have questions? Ask people who've recently bought one. Do these decks come with needles? If not what are the best ones to get? Yes they do, and if you are interested in these decks they are a great piece of kit. Will I need an additional cable to attach to my existing sound system? Does it come with a cartridge? Do you own the Pioneer PLX-500 K Turntable (Black)? Why not write a review based on your experience with it. I have just recieved a pair of PLX 500 turntables and I am very impressed with the build quality, ease of use and audio output of this product. They have far exceeded my expectations especially considering the price! I had read that the plastic build of the PLX 500 could lead to unwanted vibrations and sound distortion however after putting the decks through their paces over the past few days I have experienced no such issues. Great product; Im listening to my collection with new ears! The turntable is doing the job perfectly! I am 100% satisfied with it and can recommend it. Arrived quickly, very happy with turntables! Very well built player for the price. Great entry level turntables, value for money is amazing. Make sure you do your research on calibrating the turntable (Cartridge alignment protractors etc..) Cartridge included works fine! Loving this turntable. Itâ€™s my first proper one (before was a cheap plug in portable one) so have had a lot of fun with it. The matt black is really smart and has an elegant over all feel to it. Only thing I would say is maybe the slip mat could be a bit more interesting. But thatâ€™s personal preference. Not as good as it bigger brother but handles performance very well once fitted with a nice weighted head. The R.A.C cables feel cheap but this turntable dose give a very clear audio signal without any audio loss. The main think here is to make sure you calibrate the weight, height and anti-skipping in order to match your stylus, this is where the magic happens. I've played with these for almost 12 months now and I'd like to give these my personal rating. What can I just say I just love the turntables and these are my first ones to buy for myself and it will be brilliant when i start recording my vinyl! Couldnâ€™t be happier with this purchase. Not a Technics by any means. Build quality is not quite the same but as far as mixing goes it makes little difference. There is some reverberation when holding the record in situ when revolving but this does not effect the sound when actually playing. You can scratch but I would say there are better decks for not allot more that can do this. Some include a gereric concord cartridge as well! For home use this is perfect for me and I am more than happy with my purchase. Excellent. Bought as a gift for my fiance and he's over the moon. Had a play on these today didn't like them didn't seem to be up to much Kinda slow on take off after having lil scratch on them compared to another turntable the torque pull seemed lot more better. Audio technica lp120 seemed lot better. Brilliant turntable. I bought two for mixing and i cannot fault them. High quality turntable, built in audio interface with Rekordbox is great for recording vinyls! Low price low quality.. lower quality than price..
For the money you cant go wrong. I got the rega rp1 before the pioneer and the pioneer is at least 50% better and the rega was the performance pack version so you're paying about the same amount and you're getting a much better record player with the pioneer. One more thing to change from 45rpm to 33rpm on the pioneer you've got button's to change plus you can play 78rpm on the pioneer where the rega you got to change 33 to45 manually you've got to take the platter of and change the belt from one groove to the other groove plus if you want to play 78rpm you can't on the rega so all the plusses go to the pioneer. Love the PLX-500 and was very satisfied with delivery time and communication. 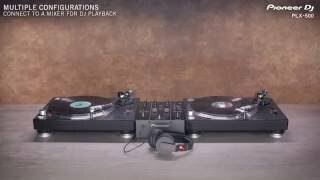 Seen a video for Pioneer PLX-500 K Turntable (Black) online or have you own video? You will earn 598 loyalty points with this product worth £1.50, when logged in. 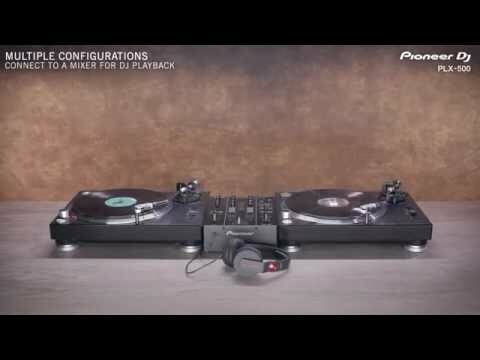 Check out Pioneer PLX-500 K Turntable (Black) on DJkit.com!